Provide a forecast of what the workforce demand would be over a five-year period to produce and market your team's technical application or process. Include the impact such production would have on the marketplace. The Palo Verde Nuclear Generating Station is a unique nuclear reactor site in Arizona and is only 45 miles from Phoenix. Maricopa County, the county that the station is in, has a population of 3.3 million and covers 9,203 square miles. The Palo Verde Station has 3 large pressurized water reactors and is considered as the largest nuclear power plant and the top power producer in the United States in 2004. Including the costs to do maintenance, operations, and fuel costs, the average production cost of Palo Verde is 1.33 cents per Kilowatt-Hour. This is significantly more efficient compared to the average production of coal, which is 2.26 cents per Kilowatt-Hour, or natural gas, which is 4.54 cents per Kilowatt-Hour, because Palo Verde imports their nuclear fuel from other countries like Canada, which greatly increases the fuel costs. Not only is Palo Verde cheap to maintain, it also generates a large amount of electricity in the Arizona/New Mexico/Nevada Power Area. In 2002, Palo Verde generated more than 30.9 million Megawatt-Hours of electricity, which is only surpassed by its more prevalent competitor, coal, which produced 68.8 million Megawatt-Hours of electricity. One of the main improvements to our plant compared to other existing sites is that we do not need to transport our nuclear waste for either recycling or reprocessing. This is because of the Archimedes filter plant, which separates the material through a plasmification process on-site. 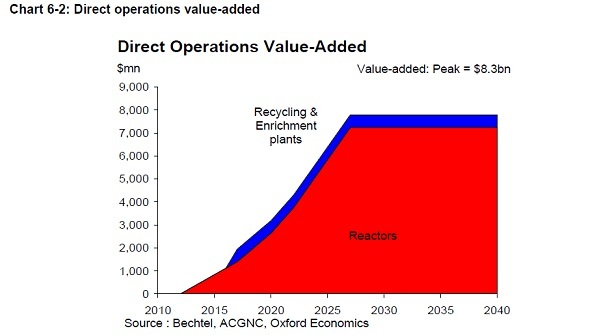 The following graph that was created by Oxford Economics predicts that there will be innovations similar to our own because even though there is a large increase in the operational cost of reactors, the operational cost for recycling and enrichment actually decreases slightly over time. The reason that the operational cost decreases over time is because the innovations cause an increase in the overall productivity of the cycle as a whole. The following charts depict the projected increase of employment in both the construction and the operation of nuclear reactors as well as the economic implications of these increasing employments. The graph on the left shows that manufacturing jobs will be more expansive and more prominent in the nuclear field compared to construction jobs. Since a manufacturing job requires more training and higher wages, the direct value-added is significantly higher for manufacturing than construction. Our employment would follow a similar trend as the two graphs with more dramatic increases because of the integration of the Archimedes Filter Plant and waste storage in the same compound. One of the problems with the nuclear field today is that the cost of the fuel is slowly but surely increasing. In a study done by the Energy Information Administration, the price of fuel from 1994-2009 has increased from $10.40 per pound to $45.86. Our plant will combat the increasing prices of uranium because the traveling wave reactor only needs a small amount of enriched uranium and we can reuse our own waste after it has been separated in the Archimedes Facility. Another benefit of the Archimedes Facility is that it can create fuel, such as Plutonium-239 for breeder reactors or enriched uranium for a boiling water reactor, to be exported by our plant to other reactor sites. The cost savings offered by shared remote handling systems. The ability to move waste and fuel products in a sealed system all the way from initial waste, through the Archimedes separation, to useful fuel loaded into a new reactor. An option to place the fast reactors in a farm on-site to feed power to the grid, or ship them out to customers, or both. Selling small reactors to schools, hospitals, etc. as you mentioned, would provide revenue support for operation of the AFP and fast reactor manufacturing. The University of Michigan has one of the top engineering programs in the country. The quality and diversity of University of Michigan’s engineering department allows students to take classes in many other fields of study while they major in nuclear engineering and radiological sciences. University of Michigan offers many courses on plasma technology, robotics, and mechanical engineering which directly relate to our product. A student who has received an undergraduate degree for nuclear engineering and radiological science would be well prepared to move into our graduate program and work with our product. Technological, industrial and medical applications of radiation, radioactive materials and fundamental particles. Special relativity, basic nuclear physics, interactions of radiation with matter. Fission reactors and the fuel cycle. An introduction to materials used in nuclear systems and radiation effects in materials (metals, ceramics, semiconductors, organics) due to neutrons, charged particles, electrons and photons. An introduction to the theory of nuclear fission reactors including neutron transport theory, the P1 approximation, diffusion theory, criticality calculations, reactor kinetics, neutron slowing down theory, and numerical solution of the diffusion equation. Analysis of nuclear fission power systems including an introduction to nuclear reactor design, reactivity control, steady-state thermal-hydraulics and reactivity feedback, fuel cycle analysis and fuel management, environmental impact and plant siting, and transient analysis of nuclear systems. A semester-long design project of the student's choice. Single particle orbits in electric and magnetic fields, moments of Boltzmann equation and introduction to fluid theory. Wave phenomena in plasmas. Diffusion of plasma in electric and magnetic fields. Analysis of laboratory plasmas and magnetic confinement devices. Introduction to plasma kinetic theory. Study of technological topics relevant to the engineering feasibility of fusion reactors as power sources. Basic magnetic fusion and inertial fusion reactor design. Problems of plasma confinement. Energy and particle balances in fusion reactors, neutronics and tritium breeding, and environmental aspects. Engineering considerations for ITER and NIF. The California Institute of Technology is renown for it’s engineering department which provides an atmosphere that inspires their students to address the technological issues of today. The California Institute of Technology prepares students for professional life in increasingly advancing interdisciplinary technology, using classes in robotics, mechanical engineering, and energy. Introduction to the study of planar, rotational, and spatial motions with applications to robotics, computers, computer graphics, and mechanics. Topics in kinematic analysis will include screw theory, rotational representations, matrix groups, and Lie algebras. Applications include robot kinematics, mobility in mechanisms, and kinematics of open and closed chain mechanisms. Additional topics in robotics include path planning for robot manipulators, dynamics and control, and assembly. Course work will include laboratory demonstrations using simple robot manipulators. The course focuses on current topics in robotics research in the area of robotic manipulation and sensing. Past topics have included advanced manipulator kinematics, grasping and dextrous manipulation using multifingered hands, and advanced obstacle avoidance and motion planning algorithms. The lectures will be divided between a review of the appropriate analytical techniques and a survey of the current research literature. Course work will focus on an independent research project chosen by the student. The faculty in mechanical engineering will arrange special courses on problems to meet the needs of graduate students. Graded pass/fail; a written report is required for each term of work. Modeling and forecasting. Heating, transportation, and electricity demand. Historical energy sources: wood and whale oil. Fossil-fuel supplies: oil, natural gas, coal, oil sands, and oil shale. Alternative energy sources: hydroelectric, nuclear, wind, biomass, geothermal, biofuels, waves, ocean thermal, solar photovoltaic, and solar thermal. Thermodynamics of energy conversion: vapor power cycles, combustion, combined cycle, and fuel cells. Transportation systems: internal combustion engines, gas turbines, and electric vehicles. Energy systems: pipelines, rail and water transport, shipping, carbon capture and sequestration, transmission lines and electricity distribution networks. Energy policy: efficiency regulations, biofuels vs. food, water impacts, air pollution, and climate. Introduction to the technologies and practices needed to fabricate mechanical prototypes. Students will be introduced to both manual and computer-aided machining techniques, as well as computer-controlled prototyping technologies, such as three-dimensional printing and water jet cutting. Students will receive safety training, instruction on the theories underlying different machining methods, and hands-on demonstrations of machining and mechanical assembly methods. Several prototypes will be constructed using the various technologies available in the mechanical engineering machine shop. Analytical and experimental techniques in the study of fracture in metallic and nonmetallic solids. Mechanics of brittle and ductile fracture; connections between the continuum descriptions of fracture and micromechanisms. Discussion of elastic-plastic fracture analysis and fracture criteria. Special topics include fracture by cleavage, void growth, rate sensitivity, crack deflection and toughening mechanisms, as well as fracture of nontraditional materials. Fatigue crack growth and life prediction techniques will also be discussed. In addition, "dynamic" stress wave dominated, failure initiation growth and arrest phenomena will be covered. This will include traditional dynamic fracture considerations as well as discussions of failure by adiabatic shear localization. Our graduate program, Nuclear Engineering Waste Conservation Sciences (NEWCS), will give students the knowledge and experience to design and operate equipment as well as thoroughly understand the systems involved in nuclear reprocessing. They will focus on the maintenance of facilities and the application of modern theories in order to increase the efficiency and safety of nuclear fission reactors. Applicants to the program should have a concentration in Engineering, or Nuclear Physics. Students must complete a semester internship at a nuclear facility, focusing on the construction of reactors and the processing/rotation of fuel. Students must also provide a thesis of an innovation to the nuclear cycle to complete their graduate program requirements.